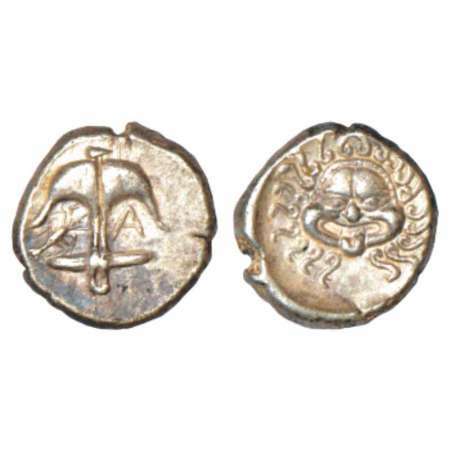 Thrace, Apollonia Pontica, silver/electrum drachm, (480-450 BC), 3.44g. Obv: Anchor, crayfish to left, letter A to right.Rev: Facing head of female monster Gorgoneion, sticking tongue out. Thrace, Mesembria, silver Diobol, (450-350 BC), SNG BM Black Sea 268-271, 1.22g. Obv: Facing helmet. Rev: Wheel with radiating lines in margin, Greek letters M-E-T-A in the wheel's spokes. 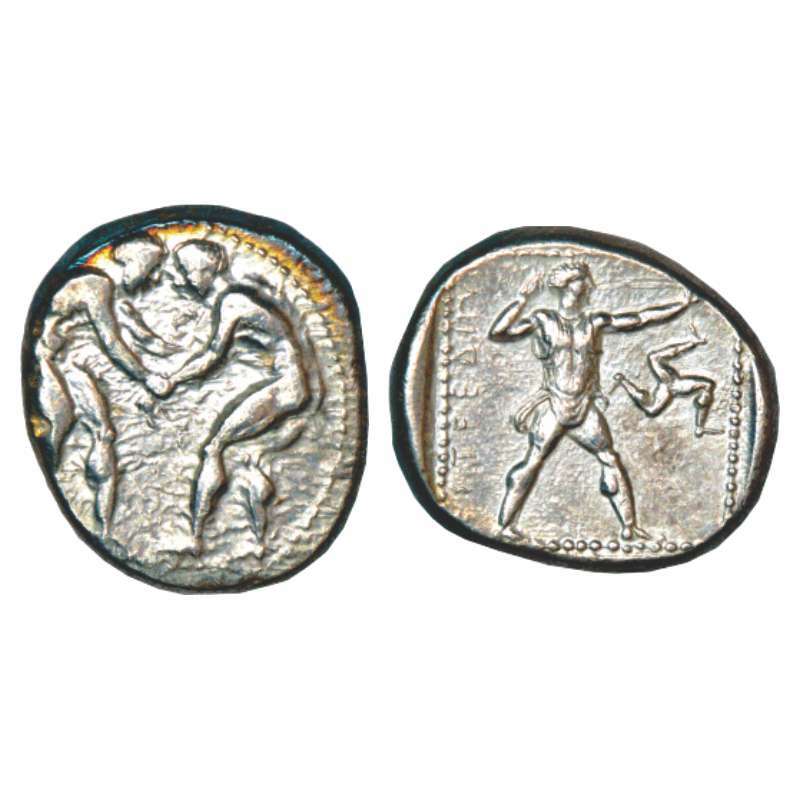 Thrace, islands of Thrace, Thasos, silver Trihemiobol (414-404 BC), 0.82g. Obv: Satyr kneeling left, holding kylix. Rev:Amphora within incuse square; Greek legend ThASION around. 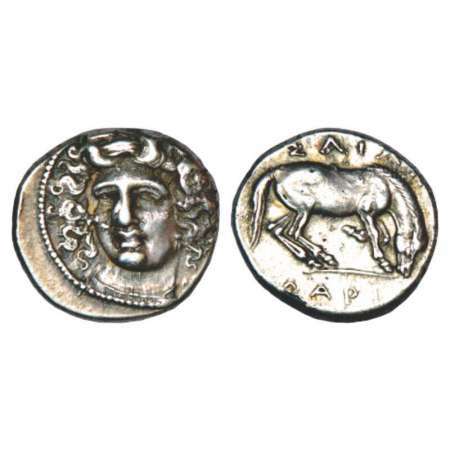 Thrace, Chersonesos, silver Hemidrachm struck (386-338 BC), 2.45g. Obv: Forepart of lion facing right, head turned left.Rev: Quadripartite incuse square with alternating raised and sunken quarters; pellet and letter 'I' in upper sunken quarter,amphora lower sunken quarter. Thrace, Chersonesos, silver hemidrachm (386-338 BC), 2.13g. Obv: Forepart of lion right, head reverted. Rev: Quadripartite incuse square with alternating raised and sunken quarters; pellet in one quarter but motif in opposite quarter is not clear. 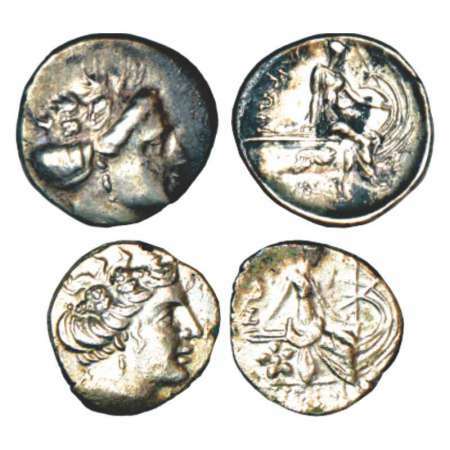 Kingdom of Thrace, silver drachm of Lysimachos (305-281 BC), Ephesos mint, struck circa 294-287 BC, 4.20g. Obv: Diademed head of the deified Alexander right, with horn of Ammon. 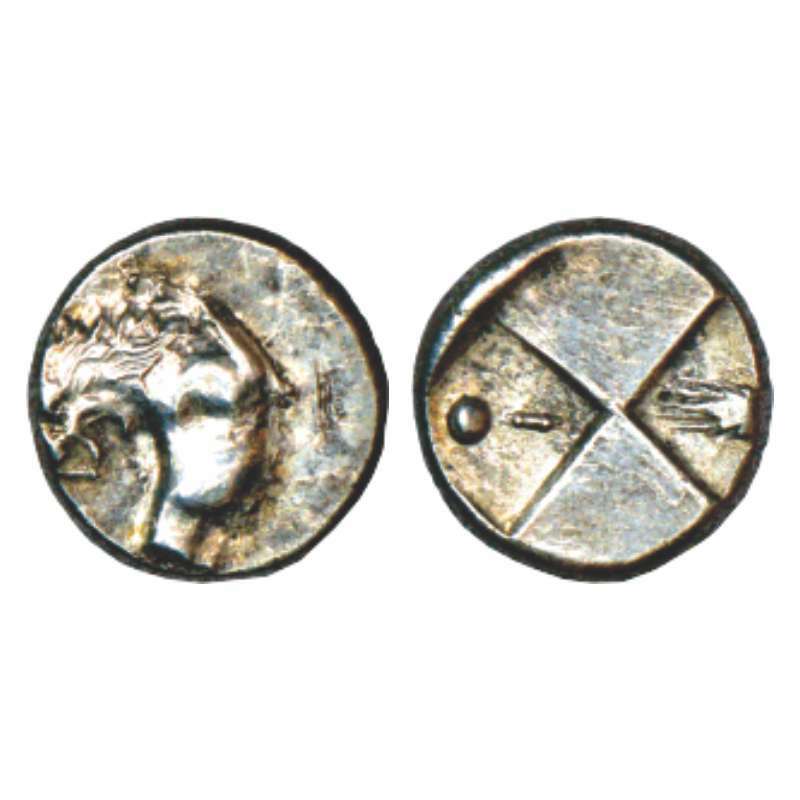 Rev: Athena Nikephoros seated left, left arm resting on shield, transverse spear in background, bow and quiver mint mark to inner left; Greek legend BASILEOS LYSIMAKhOU on either side. 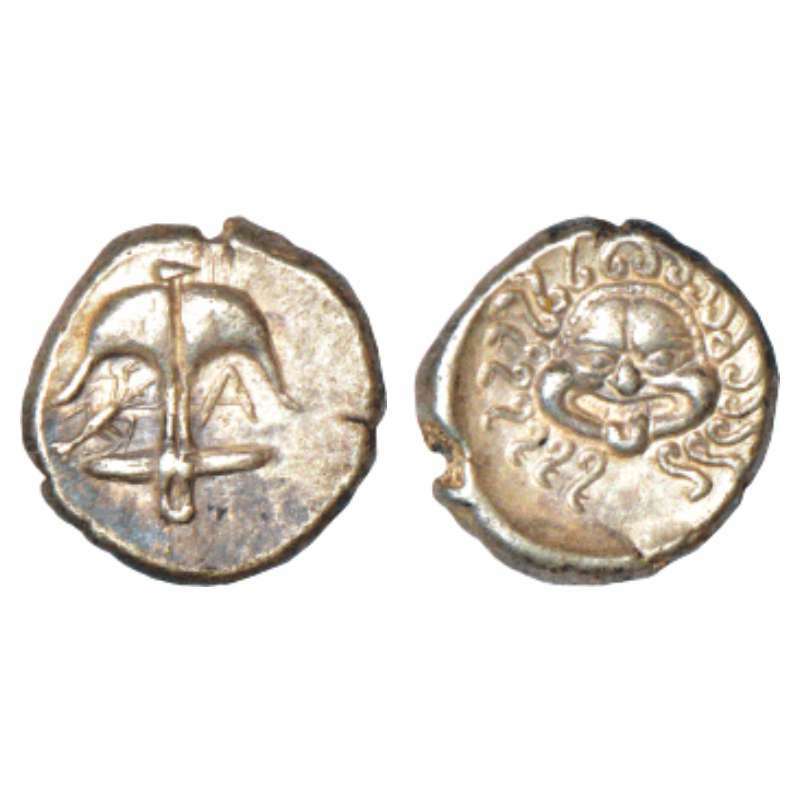 Moesia, Istrus, silver drachm, (400-300 BC), SNG Stancomb 147, 5.33g. Obv: Two young male heads facing side-by-side, the left one inverted. Rev: A sea-eagle standing to left on a dolphin, attacking it with its beak, a monogram 'A' below; Greek legend ISTRIE above. Pamphylia, Aspendos, silver stater, (380/75-330/25 BC), SNG-Paris 54, 10.76g. Obv: Two naked wrestlers, standing and grappling with each other. Rev: Slinger standing right, about to shoot from his sling; to right, triskeles running right; Greek legend ESTPhEDIIU to left. About extremely fine, Very rare. 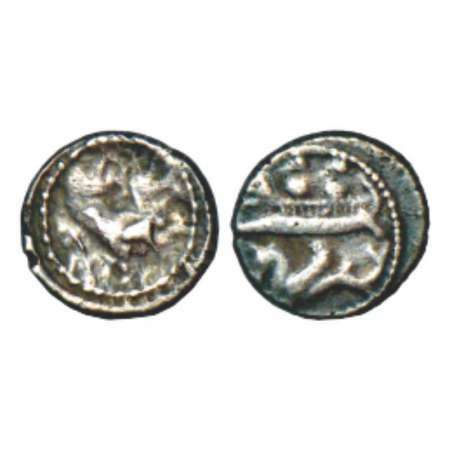 Macedon, Neapolis, silver hemidrachm (375-350 BC), SNG ANS 447-54, 1.87g. Obv: Facing head of monster Gorgoneion with tongue sticking out. Rev: Head of nymph facing right; Greek legend N-E-O-P around. 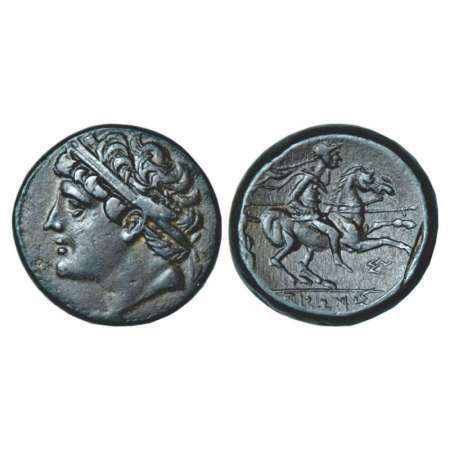 Kingdom of Macedon, bronze drachm of Philip II (Alexander the Great's father, 359-336 BC), 6.51g. 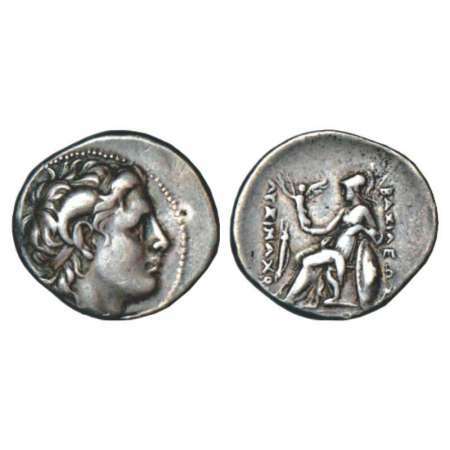 Obv: Head of young Apollo to right, wearing taenia. Rev: Naked youth on horse prancing right on ground line; Greek legend PHILIPPOU above, monogram AR monogram below. Kingdom of Macedon, bronze drachm of Philip II (Alexander the Great's father, 359-336 BC), 5.43g. 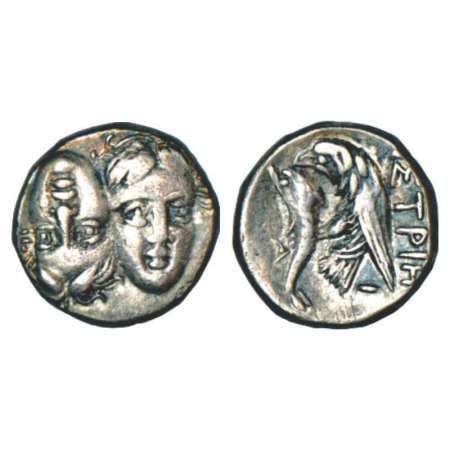 Obv: Head of youngApollo to right, wearing taenia. Rev: Naked youth on horse prancing right on ground line; Greek legend PHILIPPOU above,unclear monogram below. Kings of Macedon, silver drachm of Alexander III 'the Great' (336-323BC), Lampsakos mint, struck c.310-301BC, Price 1398, 4.14g. Obv: Head of young Herakles to right, wearing lion's skin head-dress. 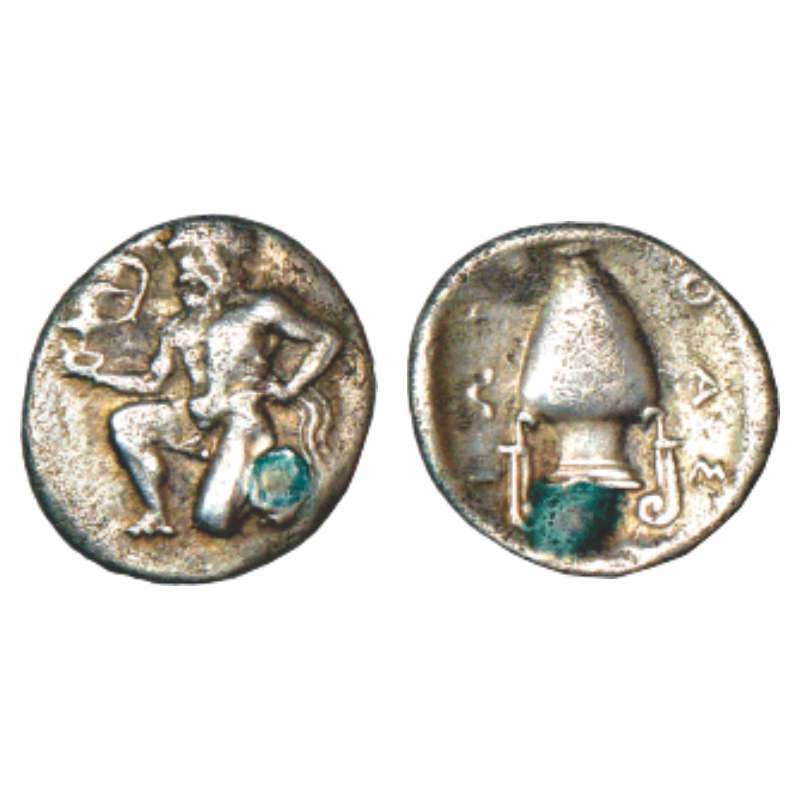 Rev: Zeus seated left on backless throne,holding eagle in his right hand and long sceptre with his left hand; to left, monogram KI; below throne, monogram NO; Greek legend ALEXANDROU to right. 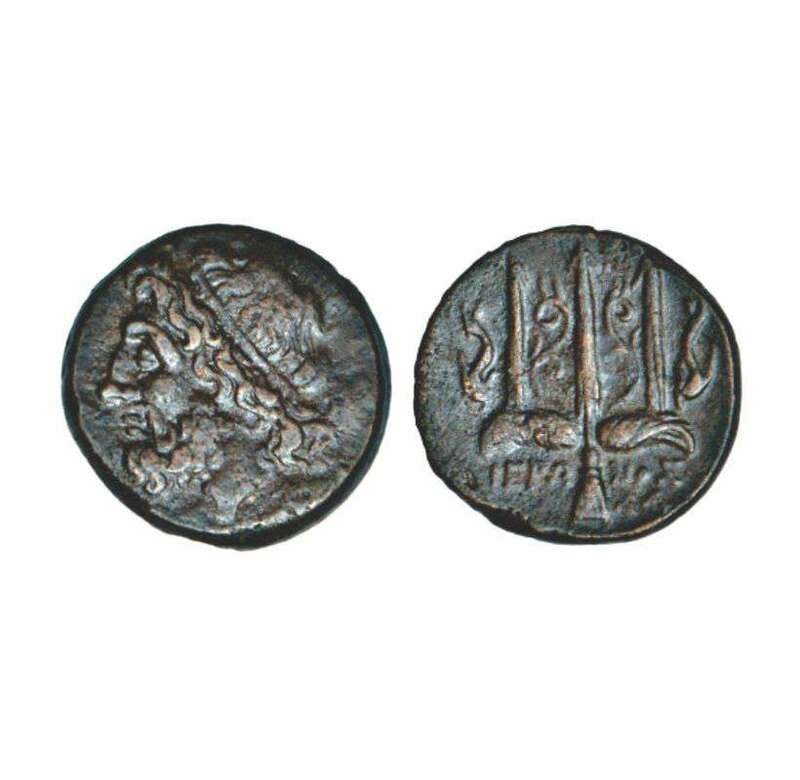 One coin has the mark of trident below the club and the other has a tree-branch. Kingdom of Macedon, bronze unit of Alexander III 'the Great', uncertain mint in Macedon, struck under Antipater,Polyperchon, or Kassander, (325-310 BC), 4.95g. Obv: Macedonian shield, boss decorated with thunderbolt with pellets above and below. 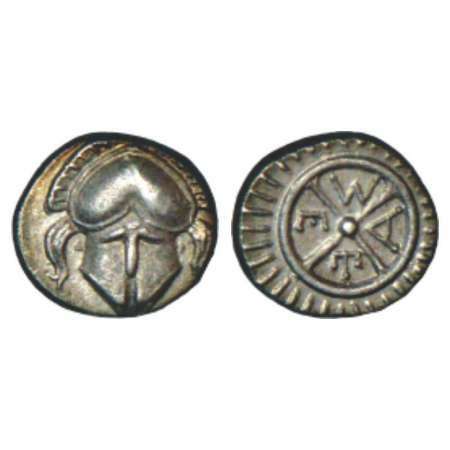 Rev: Macedonian helmet, monogram 'D' below; Greek letter B and A on either side. Macedon, silver tetrobol, autonomous period, struck under Philip V or Perseus (c.187-168 BC). 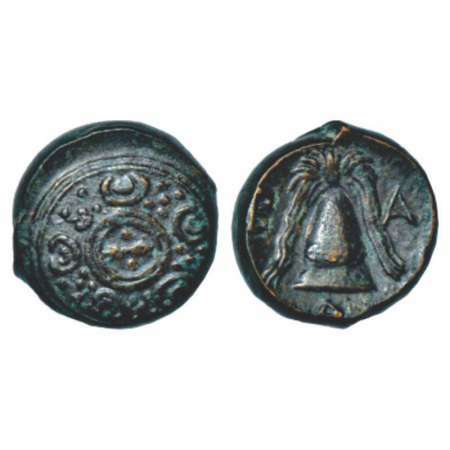 Amphipolis mint, SNG Copenhagen 1290-1, 2.21g. Obv: Head of the nymph Maenad facing right. Rev: Prow of galley pointing right; Greek legend MAKE / DONON above and below. 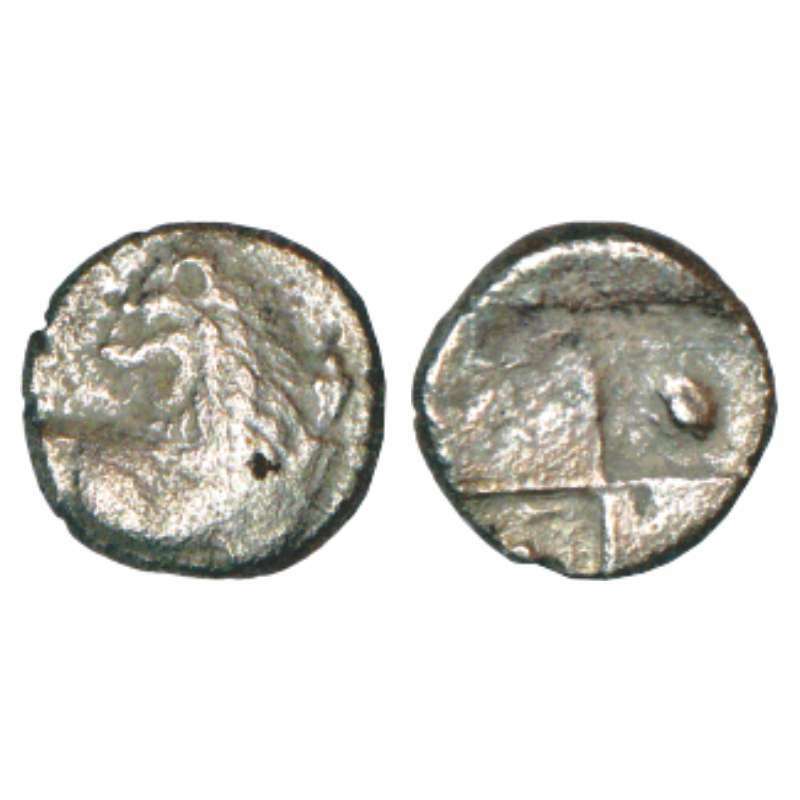 Thessaly, Larissa, silver drachm, late facing head type, (350-325 BC), Sear 2120, 6.08g. Obv: Head of the nymph Larissa facing slightly left, hair knotted in ampyx, wearing single-pendant earring and plain necklace. 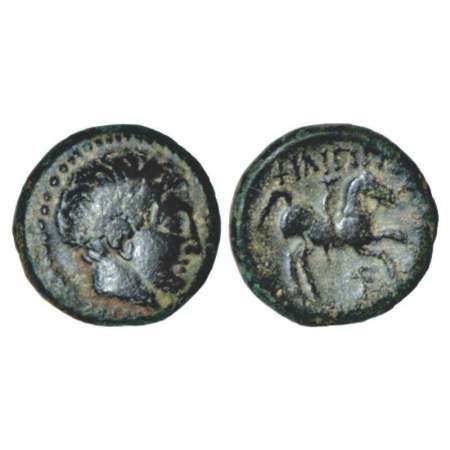 Rev: Horse standing right with forefoot raised, preparing to lie down; Greek legend LARI below and SAION above. 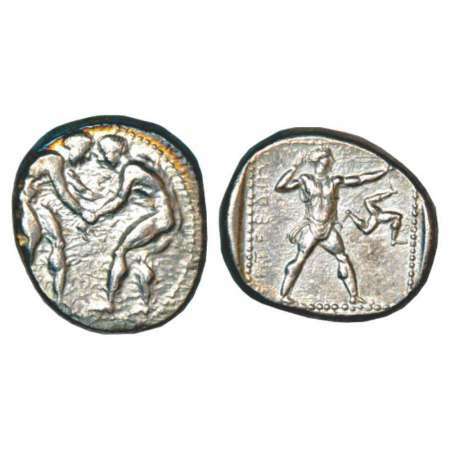 Mysia, Parion, silver hemidrachm, (350-300 BC), 2.33g. Obv: Bull standing left, looking back; star beneath. Rev: Head of monster Gorgoneion, sticking out tongue. 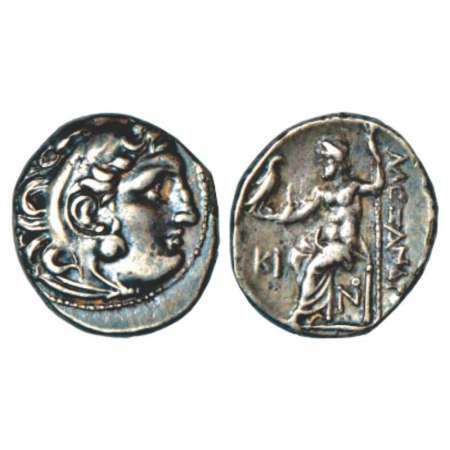 Kingdom of Paeonia, silver tetradrachm of Patraos (335-315 BC), Astibos or Damastion mint, S-1520, 12.64g. Obv: Laureate head of Apollo right. 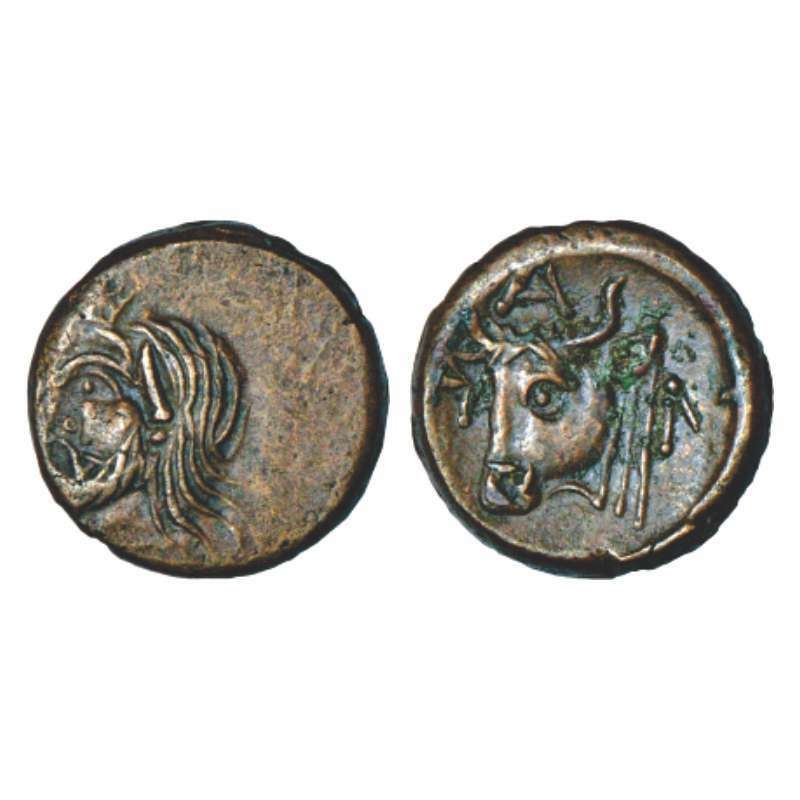 Rev: Warrior on horse rearing right, thrusting spear held in his right hand at enemy below who defends with shield on his left arm, facing bull's head behind; Greek legend PATRAOU above. 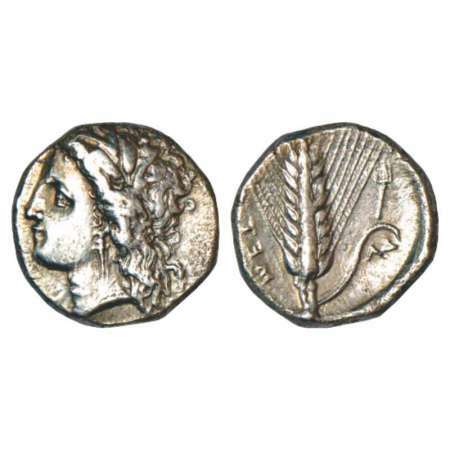 Phoenicia, Byblos Adramelek, silver 1/8th Shekel, (c. before 333BC), 0.72g. Obv: Galley sailing left with three Hoplites, hippocampus swimming left below. Rev: Lion attacking bull. Lucania, Metapontum, silver nomos (330-290 BC), Historia Numorum Italy 1582, 7.48g. 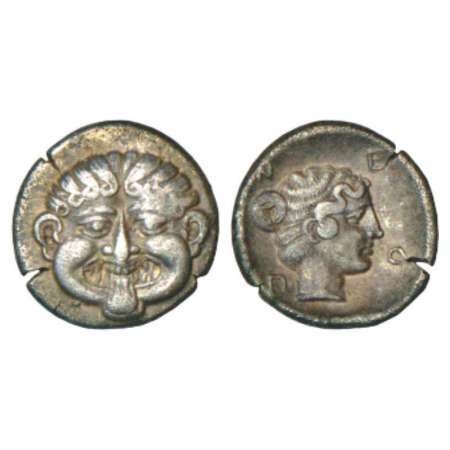 Obv: Wreathed head of Demeter facing left, wearing triple-pendant earring and necklace. Rev: Barley ear with eight grains in each truss, leaf to right with fork above, Greek letters DA below. 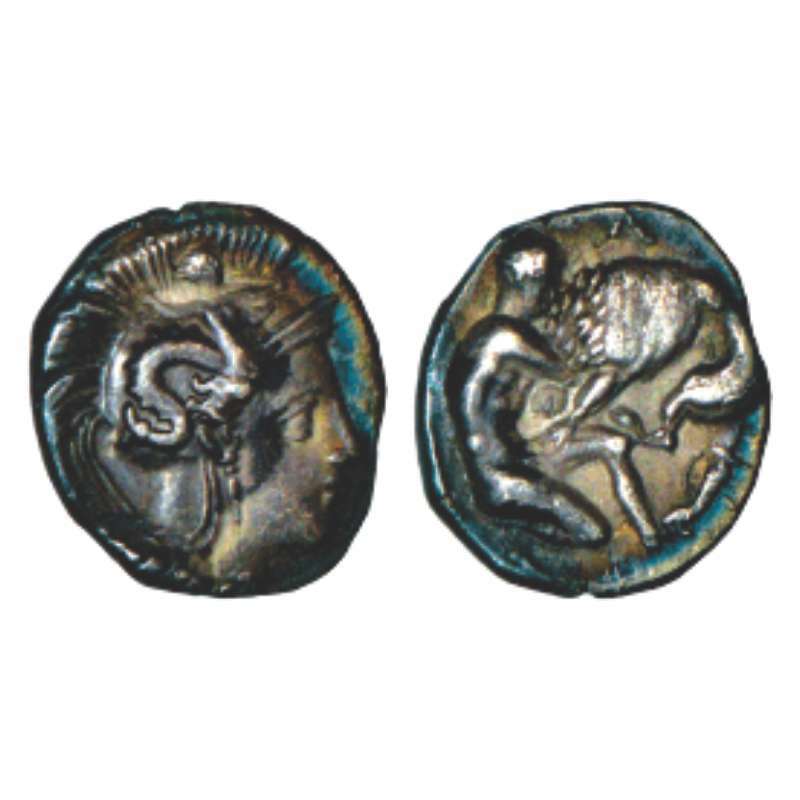 Cimmerian Bosposros, Pantikapaion, bronze unit, (325-310 BC), 4.67g. Obv: Head of a satyr to left. Rev: Head of bull to left; Greek letters P-A-N around. 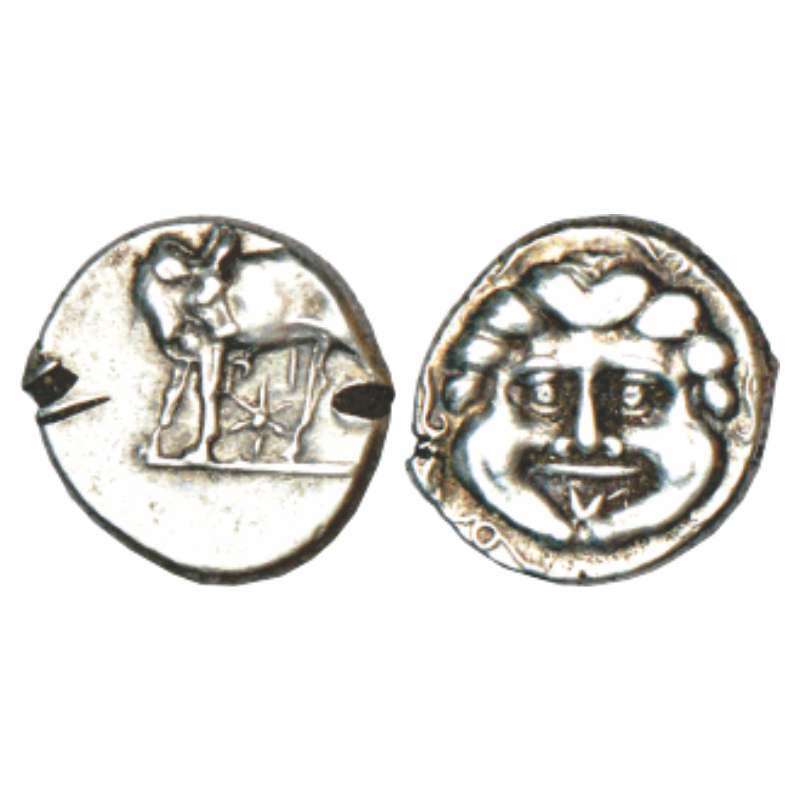 Calabria, Taras, silver diobol, (325-280 BC), 1.10g. 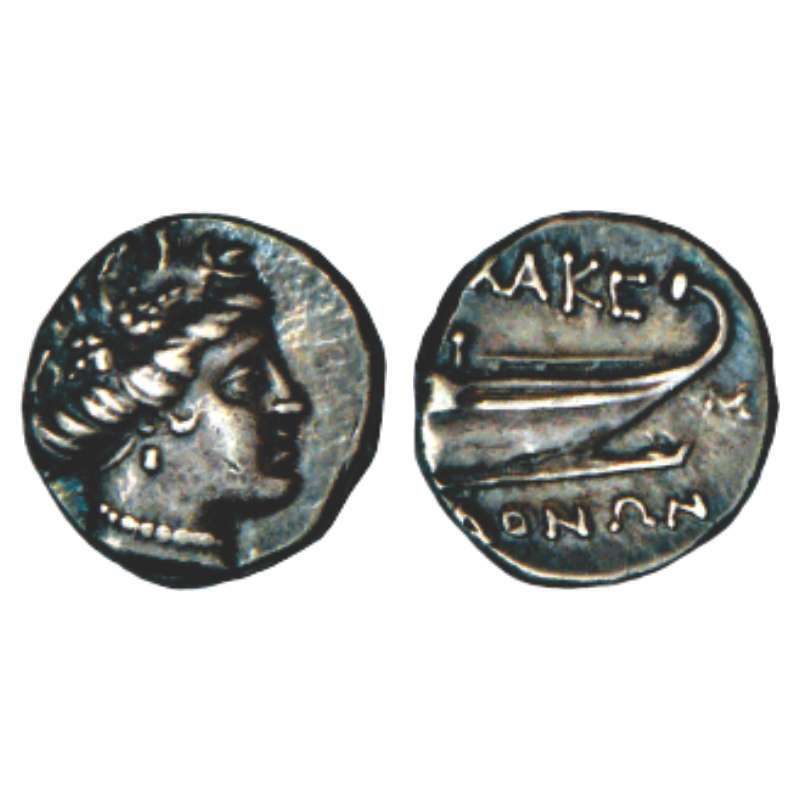 Obv: Head of Athena wearing helmet decorated with Skylla. Rev: Young Hercules wrestling with lion; letter A above. Sicily, Syracuse, bronze tetras of Hieron II (275-215 BC), struck c. 263-218 BC, 6.22g. Obv: Head of Poseidon facing left, wearing taenia. Rev: Ornamented trident head flanked by two dolphins; Greek legend IERONOS. Sicily, Syracuse, bronze unit temp. 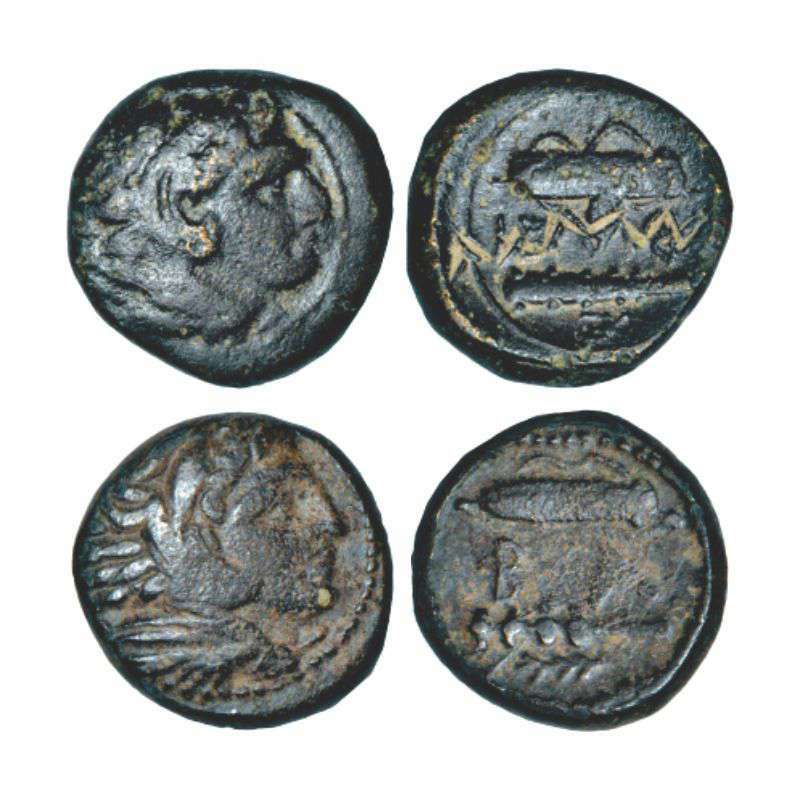 Hieron II (275-215 BC), struck c. 230-215 BC, 18.65g. Obv: Diademed head of Hieron II facing left. 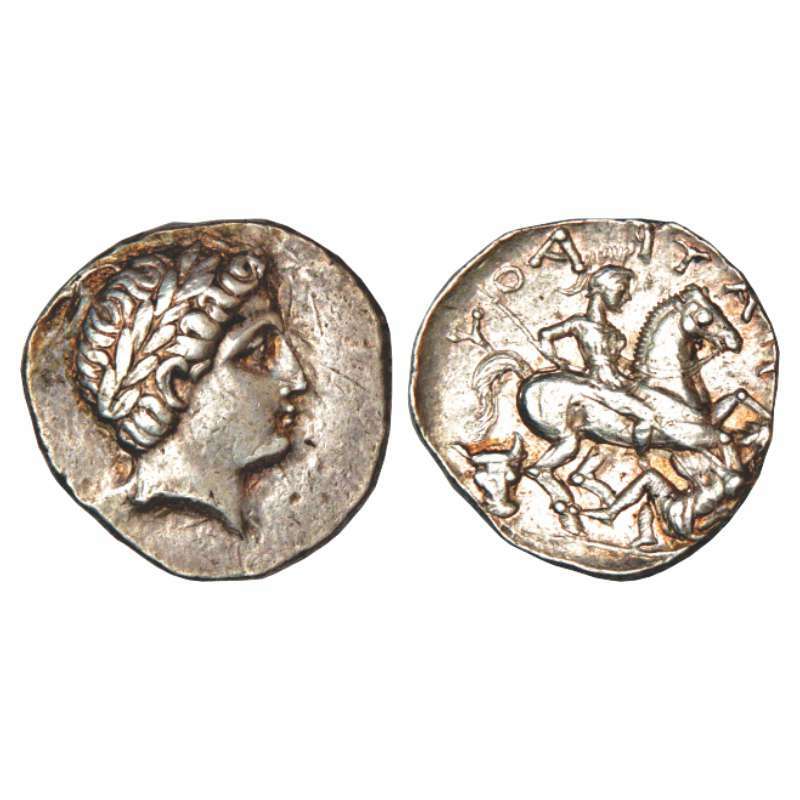 Rev: Helmeted cavalryman riding horse prancing to right, holding spear, letter 'S' below; Greek legend ΙΕRONOS below the line.